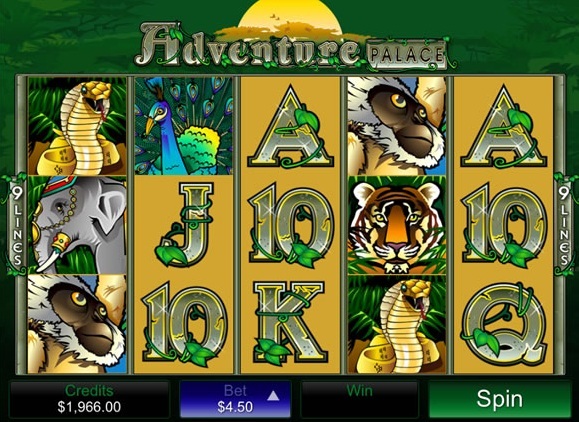 Adventure Palace is a 5 reel, 9 payline game from slot developer Microgaming that did well online, and has made a seamless transition over to a friendly tablet near you. The main difference in the mobile version is that the 9 paylines are fixed, but betting has remained the same, with coins starting at just $0.01, and a betting maximum limit of $45 a spin. 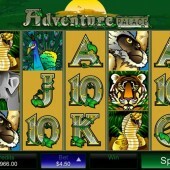 On the reels are symbols are a number of icons that you will be familiar with if you have played any jungle-themed slot before including a veritable zoo of elephants, tigers, peacocks, monkeys and cobras, as well as the familiar 10-through-Ace symbols. As with most Microgaming mobile slots, the paytable is just a swipe away, but swipe the other way and you’ll be able to select coin size and number of coins per line, plus turn the sounds on and off and deselect the Gamble Feature. The only issue I had was with the Gamble button when I hit a winning line, a tiny little button on the right-hand side of the reels which even on my tablet was a bit fiddly to access. The Elephant symbol acts as the game’s Wild, and substitutes for all symbols other than the Scatter. It also doubles all winnings in combos it helps form. The Scatter, meanwhile, is the Indian Palace symbol. Three or more Scatters triggers 15 free spins with a 3x multiplier, but with only 9 paylines you may be waiting a while to hit that reasonably generous bonus round. Freebies can, however, be re-triggered if you hit three more Scatters during the round. With fairly cute, but unspectacular, graphics, and sound FX on the, ahem, minimal side, it’s no wonder Adventure Palace works well for smartphones. Overall it’s a good entry-level slot for mobile gamers. However, Microgaming fans on the lookout for better mobile slots should head for the progressive joys of Mega Moolah, the jungle-based slot, or the call of the wild, Alaskan Fishing.